I wanted to reinforce how Garnet exists as an experience by showing both Ruby and Sapphire holding hands through Garnet! Been pecking away on this for a while since i watched the scene in the show last month and its finally done! Thanks! And gosh yes garnet ruby and sapphire are adorable! Can I have an n-word pass? THank you so much! im glad you like it! Thank you so much! im glad you love it! I am good, hope all is well with you! It's among my four favorite moments in the show for sure. 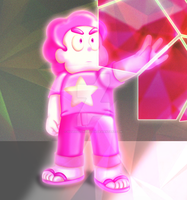 Lovely job on Garnet, I especially like how you drew her arms with the Ruby and Sapphire effect. Too good a fusion to not be in the top faves! Which one is your favorite btw? Oddly, malachite, but if she were a reformed relationship, like after change your mind. I also ship sapphire and pearl. And it's stronger than you ! The lyrics go "And it's* stronger than you" (the love that is). Morning to you too! Thank you! This fan art is perfect! love the art of yours and the song!! We are the Crystal Artists!